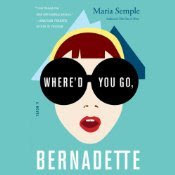 I'm listening to Where'd You Go, Bernadette. We were led to the sunroom, where Mr. Kangana had set up his marimbas the night before. The children who had to go potty did, then kneeled behind their instruments. The shades were drawn, leaving the room quite dark. The children had difficulty locating their mallets, so I began to raise the shades. Ollie-O materialized and grabbed my hand. "That's a nonstarter." He turned on the lights. I read this one a few years and Bernadette made me laugh. I gave it 4/5. Hope you like her too! Happy weekend!